Greenland is melting faster than scientists previously thought -- and will likely lead to faster sea level rise -- thanks to the continued, accelerating warming of the Earth's atmosphere, a new study has found. Scientists concerned about sea level rise have long focused on Greenland's southeast and northwest regions, where large glaciers stream iceberg-sized chunks of ice into the Atlantic Ocean. Those chunks float away, eventually melting. 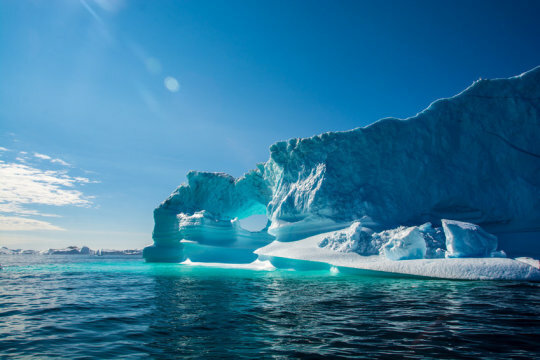 But a new study published Jan. 21 in the Proceedings of the National Academy of Sciences found that the largest sustained ice loss from early 2003 to mid-2013 came from Greenland's southwest region, which is mostly devoid of large glaciers. "Whatever this was, it couldn't be explained by glaciers, because there aren't many there," said Michael Bevis, lead author of the paper, Ohio Eminent Scholar and a professor of geodynamics at The Ohio State University. "It had to be the surface mass -- the ice was melting inland from the coastline." That melting, which Bevis and his co-authors believe is largely caused by global warming, means that in the southwestern part of Greenland, growing rivers of water are streaming into the ocean during summer. The key finding from their study: Southwest Greenland, which previously had not been considered a serious threat, will likely become a major future contributor to sea level rise. "We knew we had one big problem with increasing rates of ice discharge by some large outlet glaciers," he said. "But now we recognize a second serious problem: Increasingly, large amounts of ice mass are going to leave as meltwater, as rivers that flow into the sea." The findings could have serious implications for coastal U.S. cities, including New York and Miami, as well as island nations that are particularly vulnerable to rising sea levels. And there is no turning back, Bevis said. "The only thing we can do is adapt and mitigate further global warming -- it's too late for there to be no effect," he said. "This is going to cause additional sea level rise. We are watching the ice sheet hit a tipping point." Climate scientists and glaciologists have been monitoring the Greenland ice sheet as a whole since 2002, when NASA and Germany joined forces to launch GRACE. GRACE stands for Gravity Recovery and Climate Experiment, and involves twin satellites that measure ice loss across Greenland. Data from these satellites showed that between 2002 and 2016, Greenland lost approximately 280 gigatons of ice per year, equivalent to 0.03 inches of sea level rise each year. But the rate of ice loss across the island was far from steady. Bevis' team used data from GRACE and from GPS stations scattered around Greenland's coast to identify changes in ice mass. The patterns they found show an alarming trend -- by 2012, ice was being lost at nearly four times the rate that prevailed in 2003. The biggest surprise: This acceleration was focused in southwest Greenland, a part of the island that previously hadn't been known to be losing ice that rapidly. Bevis said a natural weather phenomenon -- the North Atlantic Oscillation, which brings warmer air to West Greenland, as well as clearer skies and more solar radiation -- was building on man-made climate change to cause unprecedented levels of melting and runoff. Global atmospheric warming enhances summertime melting, especially in the southwest. The North Atlantic Oscillation is a natural -- if erratic -- cycle that causes ice to melt under normal circumstances. When combined with man-made global warming, though, the effects are supercharged. "These oscillations have been happening forever," Bevis said. "So why only now are they causing this massive melt? It's because the atmosphere is, at its baseline, warmer. The transient warming driven by the North Atlantic Oscillation was riding on top of more sustained, global warming." Bevis likened the melting of Greenland's ice to coral bleaching: Once the ocean's water hits a certain temperature, coral in that region begins to bleach. There have been three global coral bleaching events. The first was caused by the 1997-98 El Niño, and the other two events by the two subsequent El Niños. But El Niño cycles have been happening for thousands of years -- so why have they caused global coral bleaching only since 1997? "What's happening is sea surface temperature in the tropics is going up; shallow water gets warmer and the air gets warmer," Bevis said. "The water temperature fluctuations driven by an El Niño are riding this global ocean warming. Because of climate change, the base temperature is already close to the critical temperature at which coral bleaches, so an El Niño pushes the temperature over the critical threshold value. And in the case of Greenland, global warming has brought summertime temperatures in a significant portion of Greenland close to the melting point, and the North Atlantic Oscillation has provided the extra push that caused large areas of ice to melt."